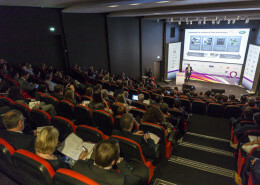 This year WorldDMB supported the AutomotiveIT International Congress, which was held in London. The theme of the event was ‘Connected Mobility 3.0 – IT Moves the Auto Industry’ and was organised by Media-Manufaktur a German publishing house whose market leading publications focus on Automotive and IT. Over 20 representatives from automotive brands and the information technology industry shared their knowledge and experiences with more than 260 attendees from over 20 countries. The event was opened by Arjen Bongard, Editor-In-Chief, Automotive IT international and Hubertus von Roenne, Vice President of BT Global Services. The sessions started with Wolfgang Ziebert, Group Engineering Director, Jaguar Land Rover who gave an overview of how the company is working alongside consumer technology companies (Intel) to ensure that the latest HMI, connectivity and technologies are included in and changing the driving experience. The need for security in the connected car was a particularly hot topic and an area which the automotive industry is focused on at the current time. 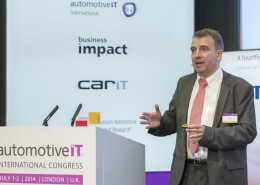 Steve Masters, Vice President, Customer Innovation & Solution Design, BT Global Services advised that with increased connectivity and data sharing the automotive industry now has to think in terms of how to protect drivers and the information gathered by more sophisticated telematics systems. Big data and the role it plays in analysing threats to the connected car were also discussed. The subject of The Future of the Showroom was presented by Norbert Brandli, Head of IT Sales & Marketing Processes, Audi AG, who focused on the new location of showrooms; moving from out of town to urban areas (Audi Cities are now in London, Beijing, Berlin & Moscow) and how the digitisation of showrooms has changed the experience of buying a car. It was highlighted that 70% of visitors to these new urban showrooms were new Audi customers and the buying experience including Media Technologies (radio) is part of an even longer list of specifications inside the car which presents challenges in the digital showroom and how Audi is solving these problems. The current worldwide automotive trends were presented by Arndt Ellinghorst, Senior Managing Director, Head of Global Automotive Research, Team, ISI group who highlighted that 60% of cars sold in Europe are sold at a loss so it is critical to understand what content (IT services) can be priced at consumers to increase aftermarket revenues to OEMs. He noted growth has been seen in UK and the US, with China driving growth in Asia and highlighted that MINT (Mexico, Indonesia, Nigeria, Turkey) is seen as the next BRIC as there is a need for mobility in the developing world. In terms of innovation it is still the German OEMs who are pushing the market although Tesla is now seen as a leader in this field with everyone asking questions about the autonomous cars and driving. He also noted that the Japanese are the only ones to make money over the life cycle of a car. In terms of trends the automotive industry is also suffering from a decline in younger drivers who are not interested in buying cars and see mobiles as the more important purchase. The morning presentations were concluded by the President of GENIVI, Philippe Gicquel who gave an overview on the current work going on in this group. The main mission of GENIVI is to drive the adoption of an in-vehicle infotainment reference platform through collaboration by bringing together 170 companies to build an open-source platform. This was then followed by a video stream from Neelie Kroes, Vice President of the European Commission. The second half of the session began with a presentation by Dirk Wollschlager, General Manager of Global Automotive Industry, IBM. Considering the five ‘megatrends’ in automotive; Connected car, the Internet of things, Big Data & Analytics, Cloud computing and Autonomous Vehicles, his concluding view was that it only makes sense to focus on ‘value added services’ in the car which can offer the opportunity for increased revenues. The main round table of the day focused on ‘Big Data’ important questions asked included; What is the business value of this data? and Who benefits from this data? The car owner, the local service station, the dealership or the OEM group? Representatives from Ford, Nissan, Pivotal, Toyota and Verne Global shared their thoughts on what data is being brought into and taken out of the car (customer, engineering) and what plans were being made to keep data safe. Also covered was how to disseminate data through departments and how to handle large amounts of data coming into IT departments. The conclusion of the session was that all of the OEMs present hold similar views on big data which was as one OEM said encouraging. Thomas Muller, Vice President Electrical & Electronic Systems, Volvo, gave a presentation on HMI in the car and how connection to the internet allows for greater interactivity and flow of information. Muller stressed that when designing cars, we ‘Need to view the world through the eyes of a customer, not an auto industry employee. Everything we do therefore starts with people.’ Ultimately, the goal of HMI is to improve the user experience, especially safety and ease of use. His presentation was followed by Peter von Manen, McLaren, who gave an interesting look into the world of Formula 1 cars. This was an excellent event well worth a visit giving exposure to new areas of the automotive sector such as dealers and automotive IT and HMI developers. The conclusion from this event was that the car industry must ensure the safety of big data within the car. Consumers need to be protected as the car becomes a hub for information. With so much data now available on drivers the automotive sector must decide what the value of this data is and how to manage this data. The experience of buying and driving is changing and the connected car can ensure OEMs build brand loyalty through offering value added services. Finally, the automotive sector must continue to innovate and improve the in-car experience of the connected car in line with consumer expectations and experiences in other areas of technology innovation. Next year’s AutoIT event will be held in Paris, 2nd July, for more information on this event visit the WorldDMB events section. This entry was posted on September 29, 2014 by WorldDAB in Automotive Industry, Europe, Events, WorldDAB Project Office and tagged Automotive Industry.